In order to accommodate all of the activities we put together for our kids, we need your help to support it. Below are a few different ways you can help contribute. The easiest way to donate to Echo Lake is through the Dolphin Fund. It is a direct donation which helps fund the tremendous activities and programs for your children as well as teacher grants, sponsored & conducted by YOUR PTA. Any contribution you can make would be great and a huge help. Our suggested amount is $35 per family. When taking into account how much we usually spend on items during a fundraiser, that's a bargain! Thanks so much for supporting the PTA!! There are many companies that will match their employees' non-profit, charitable contributions which means your donation to the ELES PTA could increase by 50-200% depending on your company's program. Most of the time, obtaining the match is as simple as filling out a form. So, check with your company to see if they offer a corporate matching gift program! Want to get a jump start to your week in the kitchen? Papa John's is supporting Echo Lake this school year. Save yourself some cooking and order pizza! All purchases will give the school a 10% return each month. At the end of the school year, the area schools who make the most of the fundraising will be in the running for additional funding from Papa John's. Last year, we received an additional $10,000 for our school! Help us reach this again! 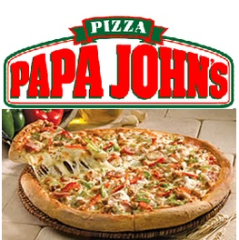 Order online at Papa John's Online Ordering and enter the code ELES. Support the school and wear your pride at the same time. We will also have a field day order for purchasing in the Spring. Thank you so much for supporting our school! Getting money for the school is as easy as grocery shopping every week. No, really! Just look for the Box Tops for Education logo on the boxes of food you probably already eat, cut them out, and send them in to our school coordinator. A bin is available outside the library for submissions to be dropped off. For each BoxTop you send, the school gets 10 cents! Last year we raised over $1500 just from this small act. Help us exceed that total this year. We will have a school wide contest later this year! Check the weekly emailed newsletter for details or contact our coordinator. We have partnered with Amazon to make it easy to give back every time you shop! AmazonSmile is a simple and automatic way for you to support your favorite charitable organization every time you shop, at no cost to you. When you shop at , you’ll find the exact same low prices, vast selection and convenient shopping experience as Amazon.com, with the added bonus that Amazon will donate a portion of the purchase price to your favorite charitable organization. Link your account today! 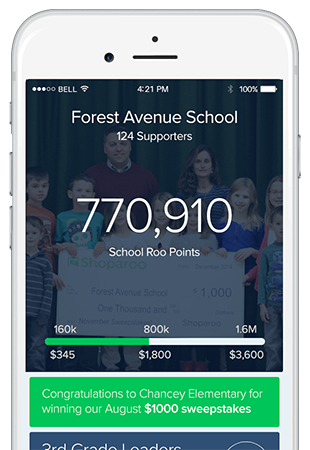 Shoparoo is a free iPhone and Android app that turns pictures of your shopping receipts into donations to our school. Just take a quick moment to snap a quick picture of your receipt and voilà, you've made an instant cash donation to the school or charity of your choice. KROGER: Enroll your rewards card every year. Kroger Community Rewards Search for Echo Lake Elementary School. You can also have this done at the customer service desk. Our code is GB240 for 2018-19. SCHWAN'S: Have food delivered to your home and help give back. Schwan's Cares Search "Donate to the Lake"